This Friday, May 2, 2014, is Arbor Day in Vermont. To celebrate, we are giving all of our guests a Gift Tree from the Arbor Day Foundation to plant here in Vermont or take home with them to remember their time away and to preserve their own area. Trees are a huge natural resource in Vermont. Not only does it help keep Vermont green (Vert = Green, Mont = Mountain), trees also help with the economy – everywhere from the logging industry to the travel industry. 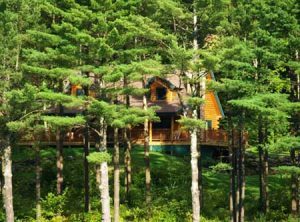 Our guests come to Sterling Ridge Log Cabins in all seasons because of the nature that surrounds our 370-acre property. In Summer, the green of the trees help shade your walks/hikes, in the Fall trees, are covered with brilliant colors, in the Winter they help with shielding you from the cold wind and keep the snow on the trails and lastly in the Spring we enjoy watching sweet sap flow from the maple trees to produce delicious Vermont maple syrup.